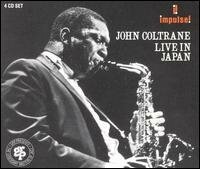 This ranks as possibly the single most extreme live recording in Coltrane's career. While his 1966 group was always up for a bit of improvisation, what makes this album stand out is both the length and the intensity of the improvisations on display. Garrison, for example, leads off both 'Crescent' and 'My Favourite Things' with a 14 minute unaccompanied improvisation on the bass. It's electrifying, and serves as a taster of what's to come. But first the listener is presented with some of the most extreme music on the record. The version of 'Afro-Blue' that kicks off this 4-CD box set is stupendous. The improvising is intense and sustained, but of high quality throughout. It reaches some pretty big climaxes along it's 39 minute length (the shortest piece here is 25 minutes), but manages to remain in some form of recognisable key and time signature throughout (well, mostly). It also perfectly vindicates Coltrane's choice of Pharoah Sanders who brings his customary harsh, overtone-rich sound to the band in a way that his solo recordings never quite captured. Alice Coltrane also plays with an intensity not seen on her solo recordings until her version of 'Leo' on 1978's 'Transfiguration' LP (also featuring onetime Trane bassist Reggie Workman, fact fans). I've mentioned the solid Garrison already, and Ali plays to the standard of the ensemble, in his usual style. While being free of the limiting need to 'swing', his ability to mark time and regulate the pulse of the piece while simultaneously improvising is unsurpassed. Simply put, this is a recording you all need to listen to.